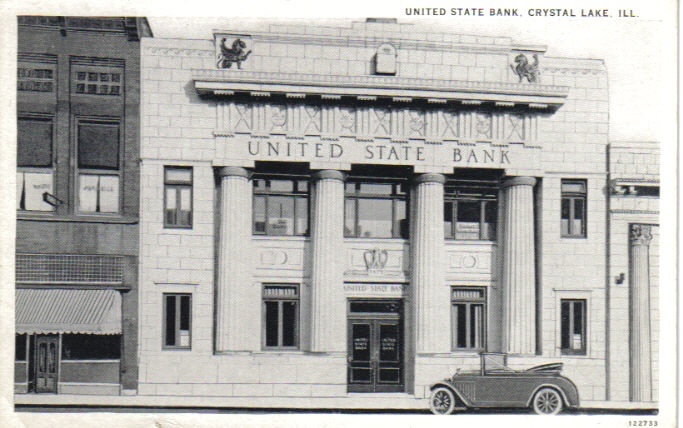 In 1931, Lynn Richards, prominent citizen and Head Cashier of the defunct United State Bank of Crystal Lake, was found dead near his car at the side of the road. Much speculation surrounds the death of Lynn Richards. The following is a full transcription of the Coroner’s Inquest. Decide for yourself – was Lynn Richards’ death a murder, suicide, or from natural causes?? Held at the J.W. Gilbert Furniture Store in the City of Crystal Lake, in the County of McHenry and State of Illinois, on the 16th day of June A.D. 1931, on the body of Lynn W. Richards, deceased. Present: Coroner E.H. Cook; Foreman H.H. McCollum; Jury on Inquest: A. Ernest Schroeder, Vayne N. Rath, E.L. Janak, A.C. Brooks, and Ed. Pinnow. A. Line foreman for the Public Service Company of Northern Illinois. Q. Where did you find this body? A. Well it was about a mile and a half just the other side of the lake on that road. Q. On the Marengo Road? Q. Was the car directly in the road? Q. In what shape did you find the car? A. In good shape, didn’t see anything wrong with the car. Q. Did you notice any tires down? Q. Was the extra tire out? A. No, didn’t see any. Q. What time of the day was this? A. Well in the first place we drove by about 8:15. There is a row of high trees along there and the sun had not come up so very high, so we first went by the gentleman lying in the shade, he wasn’t in the sun, and I said to the truckdriver, there is a gentleman taking a nap. I suppose he got tired and is taking a nap. The same thing had happened, I saw a man lying along the road, a man from Palatine and when I woke him up he got sore, so we went down the line and done a piece of work and on the way coming back, about 9:35 when we came back he was still there in the same position and the sun had raised pretty high and it was pretty hot. We drove by about 50 to 75 feet and then I said I am going to stop and investigate. That body is lying in the same position and he wouldn’t be lying in the sun it was too hot. I walked over to the body and I recognized him when I looked at him for I have known him for years. I spoke to him. I didn’t know him when I first spoke to him because I could only see the back of his head. I called two or three times and no answer so I finally bent over and I said to the men he isn’t breathing. He is dead. So I hooked up the telephone set and called the Public Service Company and got George Adler and told him, and said we wanted to work on the gentleman. And he said if you think there is any life go ahead and work on him, but it was too late. It was stiff and I told Mr. Adler to get the City Official and the Doctor and we would stay there. That is all I know. Q. Did you work on him at all? Q. Were you there when the officials came? Q. And when the Doctor came? Q. Did he say anything you heard? Q. What Doctor was it? Q. Which one of the officials came out? Q. How close to the car was the body do you think? A. As near as I could tell the head of the body was even with the bumper, I don’t know how far behind the car, but even with the bumper. Q. Have you see the car since it was brought in? Mr. Cook: That is all. A. Lineman for the Public Service Company of Northern Illinois. Q. Were you with Mr. Gaulke when he found this body? Q. You discovered the body at the same time he did? Q. In what position was that body? A. He was lying face down just about even with the rear bumper. Q. Did you notice anything wrong with the car? A. No sir, not while we were there. We didn’t walk around the car. Q. Did you notice a flat tire or not? A. No, it was long grass there and we didn’t look. Q. The car was off the side of the road? Q. About what time would you think this was? A. The first time about 8:15. Q. Did you identify the body, did you know the body? Q. The body was Lynn Richards? Q. What was done, what did you do? A. We first came there and walked over and called and nobody answered. Then Mr. Gaulke went over to the telephone line and called our office and got Mr. George Adler and told him he was going to work on him if there was any chance of working over him and we went over there and took hold of the body and it was cold and stiff. Q. Did you notice how close the body was to the exhaust? Q. Did you examine, was the car running? A. No the car wasn’t running. Q. Did you examine the gas in the tank at all? Q. Did you bring in the body? A. No sir, Mr. Warner did. Q. About what time of the day did you think that was? A. We left before the ambulance got there. A. About 9:30 when we got there, about 10 when the ambulance got there. Q. Was the body fully dressed? Q. Did you notice any tools, anything lying on the ground? a. No sir, didn’t walk around the car, just behind where the body was. Q. Were the head-lights burning? Q. Which way was the car headed? A. The car was headed west. Q. On the Marengo-Crystal Lake Road? Q. How far past the Irwin farm was it? A. About a quarter of a mile. Q. That is just before the curve there by the Brinkerhoff farm? Q. Was there any signs that the car might have sidled or run off in the ditch accidentally? A. Not that we could see. Q. When did you first hear of the accident? A. About 10 o’clock this morning. A. I think Mr. Adler called the City Hall. Q. You went out there? Q. In what shape did you find the body? A. Found the body lying back of the car at an angle of about 40 degrees. Q. How close to the exhaust did you think the body was? A. At the time I got there I should judge about 14 inches or 16 inches. Q. Notice anything wrong with the car? A. Had a flat tire in the right rear wheel. Q. Any tools on the ground? A. The tools had been taken out from under the back seat and were lying in the bottom of the car, back of the front seat. Q. Where was the spare tire? A. On the rear of the car where he was lying. Q. About where was that that the accident occurred? A. About a quarter of a mile directly west of the Irwin farm, west of the lake. Q. Was it wooded there? A. Yes on the right hand side of the road, also on the left a little bit further down. Q. The car was run off the side of the road? A. Run off the side with the right side of the car in the ditch, leaned a bit to the right, and the left hind wheel and the left front wheel were clear of the road. Q. Did you notice whether there was any bruises or scars on the body? A. No I didn’t. I didn’t look so close. Q. In what position was the body, lying on his back? A. On the left side. Q. Was the head-lights on? A. No, no lights on. Q. Was the engine running? Q. Notice whether there was any gas in the tank? A. The tank was still a quarter full. Q. What kind of car was it? Q. Were you acquainted with the person? A. Yes, we were close friends. Q. So you could identify the body when you saw it? Q. Did you notice the color of the skin, of the face or arms or hands? A. Not the arms or hands, the body was cold. I saw the face. It was flushed red. Q. Are you acquainted with the effects of monoxide gas on a body so you could tell? Q. The effects of monoxide gas on a body changes that body to a pinkish color, pink blotches, the blotches also will be pinkish. A. I didn’t see that. I came back to the telephone and called you. Q. The spare tire where was that? A. The spare tire was still on the back of the car, had not been removed. It was on the spare rack back of the car. Q. Was there a tire off the car, was there an extra tire in the back of the car? A. No the extra tire was on the back of the car on the tire rack. It had not been removed. Q. I understand George that the tire, the extra tire was off the back of the car and was in the car? A. It was on the back end of the car on the regular carrier. Q. Do you know if the boys that brought in the car changed it? A. We took off the flat tire and put it in the back of the car and put on the other one. We changed the tire before we brought the car in. Q. You reside in Crystal Lake? Q. When were you first called on the case? Q. What did you find when you got out there? A. The surroundings you mean? Q. yes, how the body lay? A. I think the body had been moved at the time I saw it. It was lying a few feet behind the car. Q. Was there any sign of life? A. No, no sign of life, rigid and cold. Q. How long had it been? A. Several hours, it is hard to say, it would be probably before midnight. Q. Did you make any examination of the body? A. Just lying there is all, no external evidence of any external injury as far as I could see. A. Well the only thing we noticed was the flushed condition of the face, it was quite red and seemed swollen. Q. Would you say there was anything that would indicate monoxide poisoning there? a. It is hard to state definitely that was the cause of the death. Q. It had a pinkish flush the body? Q. Did you notice any part of the body? A. The hands were clinched and rigid. Q. Had a pinkish color? Q. Isn’t it a fact that monoxide poison will cause pinkish blotches on a body? A. Yes and they could also come from other causes as well. Q. In a case like this where the body was so close to the exhaust wouldn’t it appear that it might be monoxide poisoning? Q. Well you wouldn’t hardly think that would occur out in the open. You could state definitely that would be the cause if enclosed within a garage. Possibly it could out in the open. I don’t think I ever heard of a case before outside in the open. I would hesitate to state definitely that was the cause. Q. Would a heart attack, would that leave the appearance of the boy in a flushed condition? A. Yes it could. Also a stroke might do the same thing. Q. There was no signs of violence? A. None that I could see, but I want to examine the body more carefully. There was none that I could notice at that time. Q. Did you notice whether there were any tools, did you notice a flat tire? A. Not on the ground. They were all in the back of the car not under the seat but lying loose as if he might have gotten them out in order to use them to change the tire. There was a large nail in the tire perhaps two inches long. Q. did you notice where the car was? A. Just barely off the road, just off so that another car could pass. Both wheels were clear of the highway. Q. did you notice whether the engine was running? A. No the engine was not running, about all the gas in the car was used up. I didn’t examine the tank but some of the boys did. The ignition was on but the engine was not running but the battery was run down so the engine wouldn’t start. The engine had been stopped for some time. Q. When the car was brought up there was enough gas left to start it? A. Yes, however it couldn’t be started with the starter. A. The spare tire had not been removed. I took the key from the car and unlocked the spare off the back so it had not been removed. Q. Was there enough gas in the car to start it? A. Not in the position it was in. It had to be pushed back in the road. Q. Only filled below the outlet? Q. In your opinion had the engine been running until the gas couldn’t get into the vacuum tank? In the matter of the inquisition on the body of Lynn W. Richards, deceased, held at Crystal Lake on the 16th day of June A.D. 1931. We the undersigned, Jurors sworn to inquire of the death of Lynn W. Richards, on oath do find that he came to his death by Cerebral Hemorrhage.